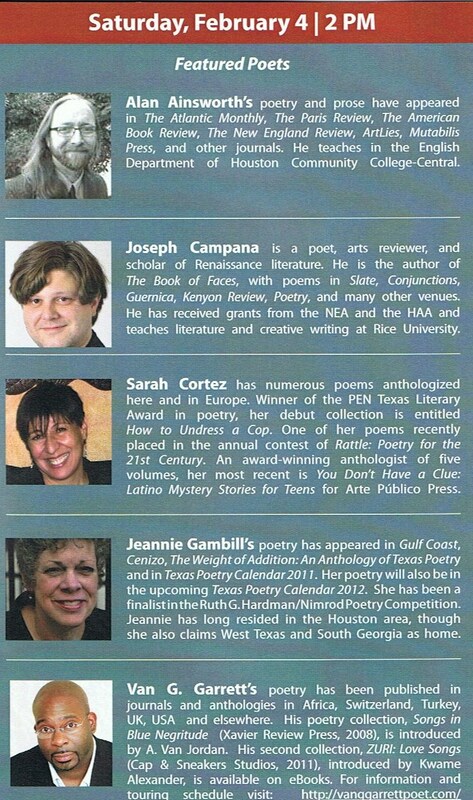 Here’s the latest news from Public Poetry, winner of the Best Reading Series 2011 from the Houston Press. Don’t miss this free event on February 4th featuring several former Writers in the Schools (WITS) teachers! Did you ever think you’d hear a local TV news anchor read poetry? Well, that’s what will happen at Park Place Regional Library on Saturday, February 4, when Art Rascon makes a special guest appearance at our next Public Poetry event at 2 PM. We’re really happy to feature him in a growing list of great special guests, including Mayor Annise Parker, choreographer Dominic Walsh, a NASA administrator, artists, musicians and more. As always, we have our line-up of outstanding featured poets with words ready – Alan Ainsworth, Joseph Campana, Sarah Cortez, Jeannie Gambill and Van G. Garrett. We’ll also hear a few short poems from some talented young students. Afterwards, there will be poetry books available and poets to sign ‘em. And if poetry leaves you feeling hungry, come join us after that at the local Mexican on the corner. Public Poetry events are all free, all ages, and everyone is welcome! See you there.